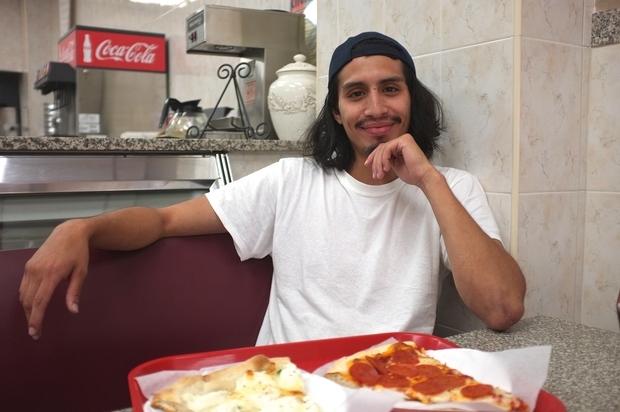 Cisco Molina, 24, and his family bought the former Gustosa Pizza on 37th Avenue. JACKSON HEIGHTS — A pizza place on 37th Avenue has a new name and new owner who wants to revamp the menu and decor while keeping its low-cost slices. Mario's Pizza, at 77-09 37th Ave., opened this weekend in the former Gustosa Pizza space after a renovation by its new owners, according to manager Cisco Molina, 24. His family bought the restaurant just last month, but he's more than familiar with Gustosa. Molina used to visit for a slice after picking up his sisters at P.S. 69 across the street while growing up, he said. Molina, who grew up in Forest Hills, spent the last few years in Colorado but came back to Queens to help with Mario's — named for his grandfather, "who made a mean slice." "We want to set ourselves apart from every pizzeria," he said. The goal for now is to churn out slices and pies, then slowly introduce a simple menu of salads, heroes and pasta dishes. Molina also wants to introduce gluten-free and wheat pizza, and add beer to the menu. "We want to keep it for the kids, but also make it a destination for adults," he said of the plan to add beer, with at least local selection on tap. Mario's will also hopefully undergo further renovations to make it better stand out, he said. But Molina is not interested in jacking up prices, with slices starting at $2.50 and pies at $15. "We want to keep it affordable," he said. "But we want to have options."